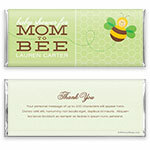 This charming wrapper design is sure to be a hit at your baby shower. Design: Honeycomb pattern and cute bumblebee. Personalization: Front event and name, back title and message.